Veins and arteries are both types of blood vessels but arteries carry blood away from the heart to the rest of the body while veins carry blood to the heart from the rest of the body. All arteries except the pulmonary and umbilical arteries carry oxygenated blood while all veins carry deoxygenated blood. The arteries are basis of the circulatory system and their main function is to deliver oxygen and nutrients through blood to all the cells in the body. They also have to remove carbon dioxide and other waste material, maintain chemical balance, mobility of proteins, cells and other elements of the immune system. The main function of veins is to transport deoxygenated blood from the tissues back to the heart. The two veins that are an exception are the pulmonary and umbilical veins. Also, arteries are always more muscular than veins. Veins are classified as superficial (those that are close to the surface of the skin and have no corresponding arteries), deep (have corresponding arteries and are deeper in the body), pulmonary (that deliver oxygenated blood from the lungs to the heart) and systemic veins (that drain tissues of the body and take deoxygenated blood to the heart). Arteries, on the other hand, are classified as systemic (part of the cardiovascular system), pulmonary (carry blood to the lungs), aorta and arterioles. 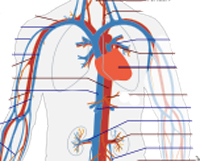 Arteries carry bright red blood as it is oxygenated while veins have the dark red blood. Arteries progressively divide into smaller tubes unlike veins. But veins are elastic tubular formations which are not as thick or sturdy as compared to the arteries. . The outer layers of arteries are made of connective tissue which covers the middle layer of muscular tissue. These tissues contract between heartbeats and give living organisms a pulse. The innermost layers of arteries are smooth endothelial cells that help in the smooth flow of blood. The tissue structure of veins is similar to that of arteries but they do not contract like them. Also, veins collapse when blood is not flowing through them unlike arteries which remain straight. lanceaksh. "Difference Between Veins and Arteries." DifferenceBetween.net. April 12, 2018 < http://www.differencebetween.net/science/health/difference-between-veins-and-arteries/ >. this site rules. this is my first time on the site and it is awesome, it totally helped me understand what i was looking for.